Gena is the star of the Dnipropetrovsk Oceanarium in Kiev, Ukraine, but not just because he’s an awesome crocodile. Gena is an awesome crocodile, don’t get me wrong, but he’s shot to fame not for what he is, but for what he’s done. Gena the crocodile ate a cell phone and has been ringing off the hook ever since. That’s right, the crocodile that swallowed a cell phone is still periodically ringing. Rimma Golovko, the woman who dropped the cell phone, just wants her SIM card and all her information back (and to stop the cell phone from racking up charges). Meanwhile, Gena wants to stop all the ringing in his tummy as eating the cell phone hasn’t agreed with him. 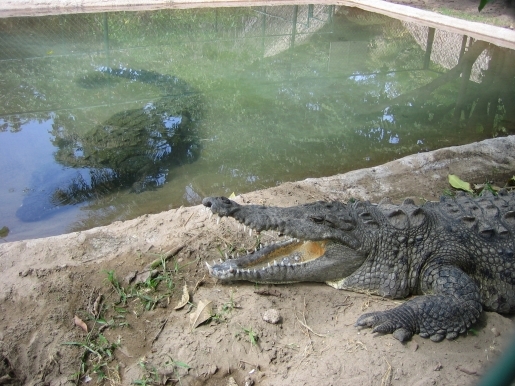 The 14-year-old crocodile has been described as listless and not eating as the ringing cell phone has seriously disturbed him mentally, if not physically, since he ate it last month. Golovko was trying to take Gena’s picture when the phone slipped from her hand and became a snack. Zoo officials are taking Gena for an X-ray later this week to determine if the phone is still inside him. If it is, they are considering surgery to remove the foreign object. The crocodile that ate the alarm clock from Peter Pan was not available for comment.